As the end of 2012 approached last night I was feeling a little down. I was sitting at home alone. My husband was at work all night until 7 am. Our daughter was sleeping. It was just me and my glass of Moscato ringing in the new year. But then it struck midnight and that magical thing happened in Germany. The thing that I always downplay in my head and "almost" forget about. The fireworks start going off. 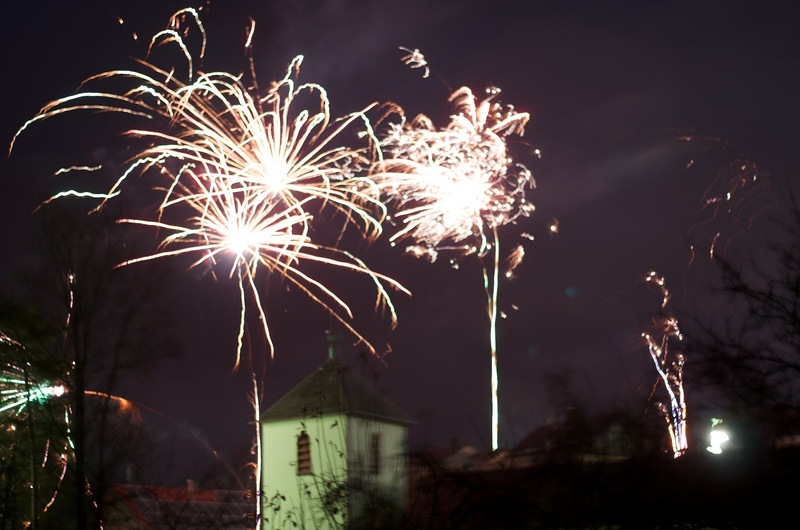 Everyone in our little German village is shooting off their own fireworks and they light up the night sky. The church bells start chiming too. "Ringing" in the new year with gusto! For a solid 20 minutes at least this goes on. Fireworks bursting and church bells ringing. It's hard not to smile. As I lean outside the window looking into our backyard and take in this magical moment, I realize this year brings new joy and new promises. Why not celebrate that. Thank you Germany for that magical moment. And thank you Moscato for my midnight kiss! So, goodbye 2012. Happy New 2013 friends! With love and gusto from Germany!